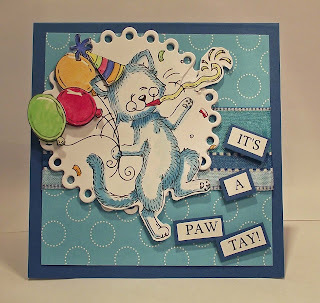 Today I am posting a couple of DT cards for the new challenge starting to day over at Craftymess Challange Blog . Our theme for this fortnight is Animal(s) with a blue colour scheme and this was chosen by our teamie at Craftymess Gemma .We are being sponsored for this challenge by Crafty-Emblies . The prize for the lucky winner of the challenge is a voucher for 10 pounds to spend in the wonderful Crafty-Emblies on-line store. So here are my DT contributions for this theme. My first card uses a digital stamp I got from Meljen Designs and I have always had a soft spot for this particular party animal ! The digi images come in a .zip file with two formats - b&w JPG, and transparent PNG. I like the JPG format as I can resize the images to suit what ever size 'canvas' I am using. I've printed the image onto white card and coloured it with watercolour paints. I cut the image to fit into a Nellie Snellen eyelet circle die and created the frame. I printed a second image but this time only colouring the hat and balloons. These were then cut out and popped up on dimensional adhesives to make them stand out from the main image. My base card is 5x5 dark blue cardstock with some Stampin' Up backing paper and a blue ribbon matted to it. The card was finished with a printed sentiment cut and adhered to the same blue card stock. My second card is a bit more sedate. Again a 5x5" tent-fold card in light blue card stock, with the bottom 3rd of the card embossed with Swiss Dots embossing folder. I cut two sizes of Spelbinders Labels 4 and used them as a frame for the bear. The stamped image is a Bumble Bear I got free with a crafts magazine and I have used Copics markers to colour him. The card is completed with three stamped dandilions from Stamps of Life embossed in white and a blue pola dot ribbon and bow embellised with a pearl button. Please take some time to pop along to the Craftymess Challange Blog and take a look at the other DT work. We have some very talented people on our DT. Make a visit and be inspired to join in. Thank you for stopping by to read my blog. Your time and comments are much appreciate. Great work. I liked both of your pieces. The right one was chosen for the DT though. Thank You - Copics graduated colour background. 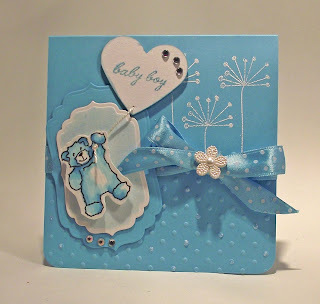 Tags Challenge - Cards Galore Challenge Blog.